Circle Family Health Care Network is teaming up with Austin Weekly News, State Representative La Shawn K. Ford (pictured above running in last year's race) and Austin Coming Together to hold the second annual West Side Heart & Sole Family 5k Run/2 Mile Walk on Saturday August 17th, 2013. This race, celebrating Mind, Body and Spirit, will kick off at La Follette Park, 1333 N. Laramie in Chicago and is open to youth as well as adults. This event will assist efforts to raise aid and awareness in the fight against obesity. Over 300 participants are expected. In a recent report by the Chicago Department of Public Health, 30% of deaths in the Austin area were due to obesity related health problems like heart disease, diabetes, and high pressure. Lack of exercise and poor nutrition can cause a person to be at higher risk for all major illnesses. Knowledge and encouragement are our best defenses against this understated killer. 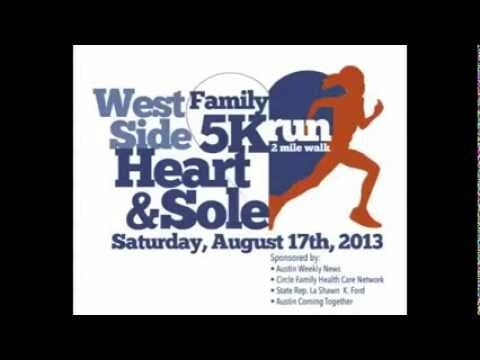 The West Side Heart & Sole Family 5k Run/2 Mile Walk will grow community spirit and good health across Chicago's West Side, sending a message to residents that personal wellness can be achieved. For more information, please visit WestSideHeartandSole2013.eventbrite.com or call Dawn Ferencak at (708) 613-3329.